While the fiction of Mythogeography is of a book assembled from numerous sources, abandoned by its editors and then rescued by the publishers, it is the work of Phil Smith, reflecting on a number of practices hinged around the act of walking. Phil Smith is an academic, writer and performer who lives in South Devon, UK. For twenty years he worked predominantly as a playwright in experimental, physical, community and music theatres, during which time over one hundred of his plays received professional productions. Since 1980 he has been, and continues to be, the company dramaturg of TNT Theatre, Munich, most recently adapting Don Quixote with Paul Stebbings for separate productions in Costa Rica and for touring in Europe. During the 80s and 90s he was active in left politics in the city of Bristol, UK, working on numerous campaigns including the defence of council housing, the support for striking miners and dockers, refusal to pay Poll Tax and on numerous small grassroots campaigns. For much of that time he worked with others to bring together different activist groups around specific campaigns, to share political education and to make politics aesthetic, including helping to organise People’s Fairs, a Labour newspaper and various benefit gigs and performances. Since 1998 he has worked on site-based performance and in its hinterlands. He has become increasingly devoted to performance related to walking and in creating subverted forms of the guided tour. 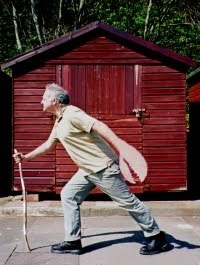 (See a short film of his performative walking, directed by Clive Austin.) The inspiration for this diversification was the founding of Wrights & Sites in 1997 with Stephen Hodge, Simon Persighetti and Cathy Turner. From the almost grandiose site-specific theatre of their first project – The Quay Thing – they have increasingly sought ways to hand over performance and performance-like actions to others, creating Mis-Guide books for others to use, organising drifting and curating the provocations of others. The idea of “mythogeography” arose very early on within the work of Wrights & Sites, as a way to describe the company’s efforts to free heritage and touristic sites (among others) from monolithic identities by provoking the multiplicity of all sites. Phil Smith has continued to create work with Wrights & Sites, but also working with many other artists on independent projects, including the Crab Walks project, Mobile Machinoeki and The Fabulous Walks. He worked with Simon Persighetti on Relics and Processions, a two year on-going research and performance project on one street in Exeter, UK. Some of the outcomes are recorded in A Sardine Street Box of Tricks. He developed a week-long, geology-oriented walking/performing project in Torbay, UK, with Tony Lidington and Hugh Nankivell: Geoquest. He has also made numerous short films with filmmaker Siobhan McKeown including one for 360 degree projection and another on Mythogeography. His books on Counter-Tourism and On Walking ...and Stalking Sebald are also a bit magic. He is Reader in Theatre and Performance at the University of Plymouth and a visiting lecturer at the University of Exeter. He is one of the authors of Walking, Writing and Performance: Autobiographical Texts by Deirdre Heddon, Carl Lavery and Phil Smith, edited by Roberta Mock. Full list of his publications.